by our newly built replica of the ship. The actual route was adjusted to fit the modern world better. Among other destinations Singapore, Shanghai, Hongkong and Cape Town was added to the route, that also returned via the Suez chanel that did not exist at the time. Map by Anders Wästfelt, Gotheborg III project logotype by Jan-Erik Nilsson. The East Indiaman Götheborg departed from Göteborg Sunday the 2 October 2005 while receiving a lot of attention from media and not the least the local people that by and large had helped and cheered the project forward from its very start with the Wästfelt excavation of the wreck site of the original Gotheborg (1739-1745). The trip was directed to its first historical stop in Cadiz, historically correct north of Scotland and west of Ireland. During this leg the Gotheborg III made a pit stop in Vigo to be the starting ship for the Volvo Ocean Race the 12 November 2005. In Cadiz was planned a 9-days stopover for official receptions, meeting with media, showing of the ship and sponsor's activities. Traditional activities is to add on provisions, and a more modern one, fuel, plus some upkeep that is impractical or hard to make at sea. Change of student crew and introduction. From Cadiz The Götheborg continued to the southwest, across the Atlantic and the equator to arrive at Recife in Brazil. The leg wet through two stilt area. By the help of the trade winds and the northern equatorial current the leg was calculated to take about one month. Christmas and New Year was celebrated on board. A few days into the new year 2006 The East Indiaman Götheborg left South America and Brazil and set course southwards along the South American coast to set course eastwards with the aid of the western winds belt. The trip from Recife to Cape Town in South Africa took about 40 days. Cape Town is considered one of the most breathtaking harbors in the world. It was specifically founded by the Dutch to serve as a useful stopover destination to replenish the many ships being used in the Dutch East India trade concentrating mainly on spices and their crews. During the earlier part of the 18th century Cape Town was avoided by the swedes due to worries regarding the competitive nature of the Swedish trade. Eventually all worries was dispersed and Cape became a popular place to renew water and food supplies as well as enjoying some firm land. The travel journal Min son på Galejan by Jacob Wallenberg from his journey on board the Swedish East Indiaman Finland in 1769-1771 has a very lively recollection of one such stop. During the 1770s two students of Carl von Linneaus, Carl Peter Thunberg and Anders Sparrman visited the Cape Town and studied the most unusual local floral fauna. The 28th of February 2006 the East Indiaman Gotheborg left Cape Town and continued to Port Elizabeth where the ship made an about two weeks long and much recognized stop. 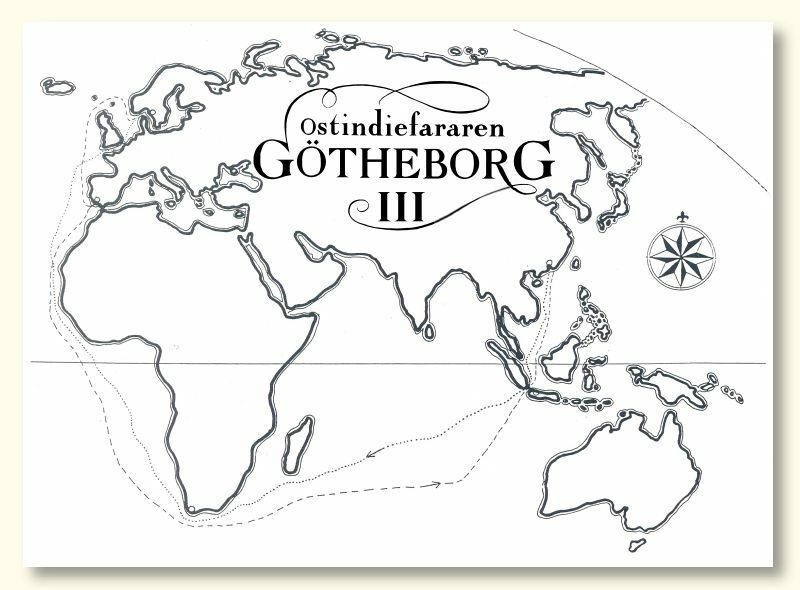 The 25th of March the Gotheborg III cast loose and set an eastern course towards Fremantle in Australia. This was this voyages longest leg of totally 4 800 nautical miles. Strong westerns winds slightly north of "the roaring forties" gave a fast passage over the South Indian Ocean in about 40 days. The arrival to the twin city of Fremantle-Perth in western Australia was the 13th of May 2006. During its more than 80 years long history of the original Swedish East India Company (1731-1813) no Swedish Ships ever visited Australia, not even by mistake, so this was a long awaited first. The East Indiaman Götheborg left Freemantle the 25th of May and set a northern course towards the Straits of Sunda between Java and Sumatra. This was historically the correct thing to do and the navigational experience should have been perfectly historically correct. Due to the prevailing winds this was a necessity. Along the route the equator was crossed again and the Christmas Island sighted before the East Indiaman Götheborg the 18th of June 2006 arrived to the historical destination Batavia, today's Jakarta and the capital of Indonesia. The 28th of June 2006, when the southwester monsoon had stabilized the East Indiaman Götheborg continued north into the South Chinese Sea. During this trip the crew was on the sharp lookout for pirates and typhoons. With the help of modern technology both dangers could be avoided. In mid July 2006 the East Indiaman Götheborg arrived to the Tiger Mouth in the Pearl River delta. After having lowered the masts to be able to continue the trip upwards the Pearl River under low hanging cables and bridges, the Götheborg continued up the river to its historical goal the city of Guangzhou (Canton). The reception was amazingly generous to the Swedish East Indiaman, the first of its kind to be sighted on this river for more or less precisely 200 years. After a few weeks of celebrations in Guangzhou the East Indiaman Götheborg continued north through the Formosa straights to Shanghai before the monsoon winds turned. The trip took around twelve days and we arrived in Shanghai the 29th of August 2006. In Shanghai the East Indiaman Götheborg was used for business meetings. The city of Shanghai and Göteborg are "fiend cities" since many years which contributed to a nice visit to Shanghai. The 28 October 2006 The East Indiaman Götheborg departed from Shanghai. First stop was the Islands of Zhoushan outside of Shanghai for her to be taken up at a shipyard where a complete renovation of the rigging was made and plus docking and painting of the bottom hull. Two weeks later the East Indiaman Götheborg was ready to start its return voyage to her home harbor Göteborg. The first stop on her voyage home was made in Hong Kong, where the ship received a lot of attention. The ship stayed in Hong Kong slightly less than two weeks and departed towards Singapore the 11th of December 2006 where she arrived the 30th of December to celebrate the New Year 2006/2007 in Singapore. The 14th of January the East Indiaman Gotheborg left Singapore where she celebrated New Year and crossed the Bengali bay to arrive at Chennai in the end of January. After Chennai the East Indiaman Gotheborg set course towards Colombo at Sri Lanka where the plan was to take onboard a fresh supply of fuel, which turned out to be more difficult than expected because of the weather and the problems for the tanker to more alongside our sailing ship, why the fueling was given up. The trip was continued without any extra diesel. Thanks to good winds and the crews new and invented ways of setting as much sails as possible we arrived to Djibouti the 14th of march where fresh food - and diesel - could be taken onboard. After a three days long stop in Djibouti the East Indiaman Gotheborg continued its homeward voyage through the Red Sea and the Suez channel and on to Alexandria for another three day long stop. Stayed in Niece between the 17th to the 24th of April. After an eight days long stop in Nice the East Indiaman Gotheborg continued after a short bunker stop in Gibraltar towards London which is the last destination before the Gotheborg successfully have arrived back to its home harbor. Saturday the 9 June 2007 something truly extraordinary and fantastic happened, that had taken more than 20 years to prepare and involved the efforts and expertice of thousands of people, companies and organizations. For the first time in more than 250 years a Swedish East Indiaman, a sailing wooden ship and as close a replica that we would be allowed to sail, arrived back to Gothenburg after a successful voyage to China and back. Thank you all for sharing our dream and making it your own! 1) The International Hydrographic Organization, whose membership includes essentially all seafaring nations, and the International Bureau of Weights and Measures use M as the abbreviation for the nautical mile.